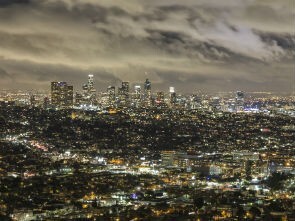 Nowhere in the US does the dream of stardom, wealth and luxury come more true than in Los Angeles. Speaking of gay L.A. means in reality speaking of the autonomous city of "West Hollywood", one of the gayest centers of north America. Santa Monica Boulevard could also be called Rainbow Boulevard. The gay center of Los Angeles is in "Silverlake" to the north of "Downtown". Smaller centers of gay life are in the Valley to the north of Los Angeles conurbation, on the beaches to the west and in Long Beach to the south. A car is indispensible. With it you can reach the gay resort "Laguna Beach" in 90 minutes. A lot, which seems to be gay, is only a façade, but what can one expect in the city, where façades are produced for films. And looking behind the façade of Hollywood is nearly impossible; production halls are not that impressive. Small glimpses of the myth can be gotten on the "Walk of Fame" on Hollywood Boulevard or in the "Universal Studios" on Hollywood Freeway. But one product of Los Angeles is not just façade: the charity for AIDS-victims. Events like the "California AIDS Ride" (on bycicle) or the "AIDS Walk LA" bring large amounts of money for the AIDS-stricken, plus the opportunity to exhibit yourself and keep fit. An activity, which can also be done beautifully in "Venice" on the coast. More reasons for visiting L.A. are the pride-events or the gay days at "Disneyland".